Adam Caine is a guitarist, improvisor and composer. Adam fronts the Adam Caine Trio with Tom Blancarte and John Wagner and the Adam Caine Quartet with Nick Lyons, Adam Lane and John Wagner. Adam also plays in Johnny Butler’s Scurvy and Eric Eigner’s Mysterium. Adam grew up in Rochester, New York and studied music at the University of Rochester. Since 2000 he has lived in Brooklyn, New York and has played in New York City and throughout the United States. Adam has performed with Connie Crothers, Paul Smoker, Daniel Carter, Ken Filiano, Phil Haynes, Glen Branca, Haale, and the New York Soundpainting Ensemble. 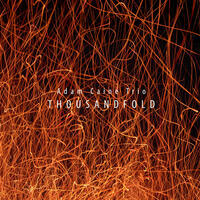 Adam’s 2005 CD, "PIPE," received rave reviews in the Wire, Cadence, and All About Jazz. In 2008, Adam was awarded a grant from the Brooklyn Arts council for an improvised performance with visual artist Marjan Moghaddam. As a composer for video art, Adam’s music has been featured in over 20 international festivals since 2006.